When attempting to address gender inequality I am amazed at how many people tell me, “We don’t have those problems in our organization.” I remember thinking this is a tricky world I was entering into, not because I am right or wrong but because there are people out there who will oppose any discussion of the issue and immediately shut the conversation down. Organization leadership might say otherwise, but what it says it wants regarding gender inequality and what is actually happening are two different things. As W. Edwards Deming said, “In God we trust all others must provide data.” Simply break down the management, senior management and executive positions by race, gender, age and ethnicity – what do you see? Inequality! Gender bias is a popular media subject. Looking at today’s media headlines there is frequently discussion about gender inequality in one form or another. Until organizations start developing practices that address the root causes of gender inequality, namely bias, lack of transparency and accountability, the headlines will continue. Why is “Think Leader –Think Man” still the default button in organizations throughout America? Perhaps a story will help explain the phenomenon. This story illustrates that women leaders don’t often get the same recognition as men for their accomplishments. This gentleman assumed, based on his own bias, that her father built the business and that she must have inherited it instead of building it herself. In my opinion the same assumptions would never be made if she were a man. A man who asks questions, makes inquiries and seeks consultation with others while working through assignments is perceived as being thorough. When women do the same, this is often interpreted as indecisive and evidence that they depend on others for ideas or execution. Women are perceived as emotionally driven decision makers. They see the world more emotionally and therefore do not make decisions based upon facts and data. Male bosses may feel uncomfortable giving women constructive criticism; concerned that women may get too emotional and don’t want to hurt their feelings. Men don’t have the same issue with other men; they tell it like it is. The effect is that women are placed at a disadvantage by not receiving the feedback, coaching and development necessary to improve their skills and abilities. When one considers that an individual’s performance is a function of how they are managed, the disadvantage grows. Women are often not perceived as proactive in the managing of their careers, asking for career advancement advice and demanding competitive pay. Men are viewed as more “take charge” in their careers; they ask the questions and therefore are perceived as more career oriented. Men are viewed as having more career motivation than women. 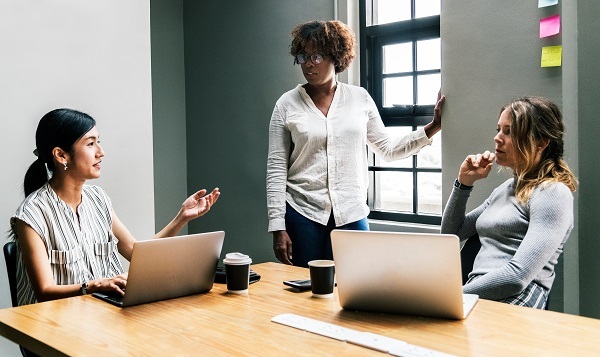 The “Think Leader – Think Man” assumption results in women having to constantly contend with men speaking over them or ignoring what they have to say in meetings. Women maybe hesitant to speak up or shoot from the hip unless they have the right answer. Men don’t worry about this. Biases and assumptions are used as a basis for decision-making, sometimes consciously and sometimes unconsciously. Biases and assumptions affect all aspects of the selection process. When one considers that assessment of performance is a highly subjective decision influenced by biases and assumptions, it is no wonder that the “Old Boy” network still exists. As a young, untenured college professor in 1988, I, along with a woman colleague, completed a two-year research project on women in corporate management positions. The findings showed that men and women, operating at comparable managerial levels, were not reading the work environment in the same way. They were not interpreting advancement, or the requirements to achieve it, in the same way. Neither the men nor the women could articulate with any consistency what it took to reach the top. Today, over thirty years later we have the same issues. There is still a lack of transparency and clarity as to what combination of experience in core business areas, specific skills, knowledge and ability is required to perform a role in management or senior management. If organizations remain complacent about this issue, we will continue to have biases and assumptions, personality or “networking”, comfort and chemistry be the most critical factors in the selection process. Peter Senge in the Fifth Disciple tells a fable about corporate failure. He calls it “The Parable of the Boiled Frog.” According to the fable, a frog’s survival senses are attuned only to immediate threats. If placed in a kettle of boiling water, for example, a frog will leap from the pot at once. But if the frog is instead placed in a pot of water at room temperature and not frightened by his handlers, he’ll stay put. As the heat under the pot is gradually increased, the frog will not recognize the dangers that he faces until it is too late. Initially comforted by slow warming water, the frog will become groggy. When the heat finally poses a real threat, the poor frog will have grown too weak to jump from the pot of boiling water. Senge maintains that corporations are a lot like frogs. In corporate America, immediate threats are budget and revenue goals that lead to profitability or service and efficiency levels that are accurate, complete and timely. Like good firefighters, CEO’s and executives sense of organization danger is attuned to abrupt dramatic threats to budget and revenue goals. Gender equality doesn’t pose an immediate threat to the organization and is therefore often overlooked. The danger associated with this complacency is a practice of mediocre measurement and no accountability for selection decisions. Without selection decisions being scrutinized and hiring managers being held accountable for those decisions, why would anyone expect that a male dominated executive management team would have a sense of urgency to change the present promotional system? If a man is comfortable and complacent in his drama free world of no accountability or fear of reprisal, what incentive is there to change? Logic would suggest the real reward for men comes not from changing the system but from maintaining the “Old-Boy” network status quo. More importantly, by questioning the legitimacy of promotional systems currently in place, it might then serve to delegitimize their positions and how they attained it. Why would they do that? When organizations begin treating gender equality as an immediate threat and establish practices that support that position, hiring managers will begin ensuring that their selection decisions are accurate, complete and substantiated. This of course suggests that monitoring selection decisions becomes a practice and not artful deception. Does your CEO hold their executive and senior managers accountable for developing and maintaining a workforce with gender equality? Is it part of their formal yearly performance appraisal? If so, what percentage of the overall appraisal does gender equality represent? How many of the executive and senior managers do the same to their managers? Is it part of the formal yearly performance appraisal? Unless someone is measuring gender equality and there are meaningful incentives and penalties associated with its accomplishment, chances are “Old Boy” status quo will be maintained. In this article I have described an institutional pattern, which deprives organizations of reaching full capacity. In short, there are many hidden talents, abilities and resources that have never been tapped by the organization due to the “Old Boy” network. Over the years there has been a lot of noise about gender equality but very little has changed. Sure there are a lot of women at the senior management level but not at the executive level. This seems to me to be where the “glass ceiling” is the strongest. Organizations tout that they have women leaders, but the women are still not in the top ranks. The issues raised in this article are not complex in nature. Everyone should be aware of the “rules of the game” for promotion, people should make selection decisions based on performance and these same decisions should be monitored for gender equality. When you consider the technological and scientific advancements we have made in transportation, medicine and technology, this isn’t rocket science. In the end what every organization should strive for, along with gender equality practices, is a culture that will look at my granddaughter as a senior manager who happens to be a woman as opposed to a woman who is a senior manager. I also hope that she finds a place that will allow her to pursue Dr. Seuss’s “Oh the places she will go?” I believe that the likelihood of her finding such a place is not good until the “Good-Old” boy network is permanently dismantled.